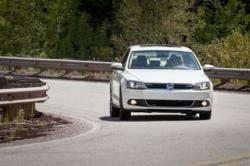 The 2013 Volkswagen Jetta Hybrid impresses Tucson Volkswagen shoppers as a fun to drive and fuel efficient hybrid. Eco-friendly hybrids are not usually known for their prowess off the line, but the Jetta Hybrid went from 0-60 mph in only 7.9 seconds. A turbocharged and intercooled engine and transmission boost performance, giving this five-passenger, four-door sedan a sporty performance similar to the Jetta GLI. Add in a Fender® premium audio system with eight speakers and a subwoofer, a nav system with touch-screen control and SD memory card reader, leather seats and sunroof, and Volkswagen has the makings of the ultimate green machine with the SEL model that is available now at Chapman Volkswagen Tucson. Although drivers won’t be racing on the Autobahn due to a governor that limits your top speed to 127 mph, the DOHC 16-valve, 1.4 liter inline 4 does produce an impressive 150 hp. The traditional tachometer is replaced by a”Power Meter” which displays the dynamics between the engine and batteries, allowing drivers to monitor how thrifty their driving habits are. To the right of the Power Meter is a Multi-Function Instrument, which shows ambient temperature, gear selection, a trip computer, second audio display and driver settings. This screen also shows the vehicle’s drive state and the “ePower Meter,” which indicates the battery charge level and the “E-Max” – the available amount of electric driving. Fuel economy for Jetta Hybrid is EPA rated at 42 mpg in the city and 48 mpg on the highway. Volkswagen Jetta Tucson shoppers will find in addition to being a fun-to-drive car, the Jetta Hybrid presents an industry-first innovation in the way it connects the powerplant to the pavement. It does it by using a seven-speed, DSG® dual-clutch automatic gearbox. The DQ200 transmission is the most efficient unit in Volkswagen’s DSG arsenal and employs a dry-clutch design, as opposed to the wet-clutch arrangement seen in many other Volkswagen products. This unit can be operated as a pure automatic (“D” mode) or shifted manually. There also is a sport setting (“S” mode). To blaze a trail of off-the-line glory, check out the Jetta Hybrid at Chapman Volkswagen of Tucson. For more information, visit the dealership’s website at http://www.tucsonvw.com.